With tax season upon us, you might be like many investors right now looking to juggle things a bit in your portfolio. It’s been an exciting couple of years, what with marijuana stocks booming and oil and gas plummeting, so looking into some blue chip stocks that will see strong growth over the long term is where you should be headed. But that doesn’t mean the options aren’t endless. Between banks, top TSX and energy stocks, there are a lot of ways to lose your head. In my opinion, having these three stocks in your portfolio should set you up for huge success over the next decade. There’s a reason I put the last decade in the chart above. I want you to visualize where these stocks have been, and where they could be headed. What the stock doesn’t show you is the starting price. So let me fill you in and give you an example if you had just 50 shares in each stock a decade ago. Royal Bank of Canada (TSX:RY)(NYSE:RY) had a January 2009 price of $30.41; today it would have grown from $1,520.50 to $5,112. Enbridge Inc. (TSX:ENB)(NYSE:ENB) had a January 2009 price of $23.20; today it would have grown from $1,160 to $2,454.50. Pembina Pipeline Corporation (TSX:PPL)(NYSE:PBA) had a January 2009 price of $14.25; today it would have grown from $712.50 to $2,453! All of the above stocks have clearly performed well after the last recession, and with one in our potential future, it could be the right time to wait for prices to come down and buy up while you can. Royal Bank may be one of the top two largest banks in Canada, but it still won’t be safe should a recession happen both here and over the border in the U.S. The bank has a lot invested in the Canadian housing market, so should a recession happen, it’ll be hit hard. But that also doesn’t mean it’ll be down forever. The stock bounced back fairly quickly after the last recession, and is set up to do so again should things go south, and that’s in part thanks to our southern neighbour. Royal Bank has invested heavily in expansion through the U.S. in high-net-worth and commercial banking. This will create high-margin growth for a long time to come. In addition to the extras, Royal Bank is strong at home too. Its Canadian banking business sees returns on equity exceeding 30%, and that should continue far beyond any potential recession. If you’re going to invest in just one energy company, it has to be Enbridge. 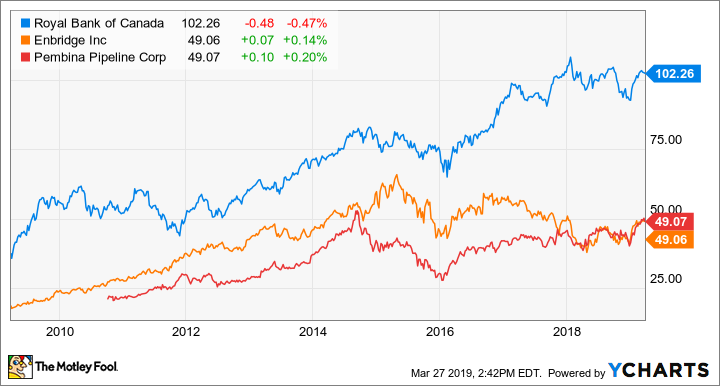 This pipeline is a titan in its industry, and despite the recent downturn from the glut of oil and gas, once its pipelines have been approved it should see its stock price soar. But in the meantime investors won’t be suffering. Enbridge’s regulated oil and gas output means it has a stable, steady and strong influx of cash that should flow in for the long term. Investors can look forward to a steady income that’s threefold: continuing projects, approved projects, and a dividend that has grown consistently over the years. Now it’s not all good news for Pembina investors. The company isn’t as stable in the market as Enbridge, and will have to compete for midstream projects if it hopes to grow. Then there’s the environmental blockades that have plagued the industry, so investors may have to wait a while before new pipelines are approved. But again, we’re looking for stable growth, and Pembina still has that. The company isn’t just focused on Canadian expansion, but has a number of long-term contracts both here and in the U.S. that should see its stock steadily rise over the next decade. Once its expansion project is finally approved, investors should be rewarded through the company’s dividend that sits right now at a healthy 4.66%. Fool contributor Amy Legate-Wolfe owns shares of ENBRIDGE INC and PEMBINA PIPELINE CORPORATION. Enbridge is a recommendation of Stock Advisor Canada. Pembina is a recommendation of Dividend Investor Canada.